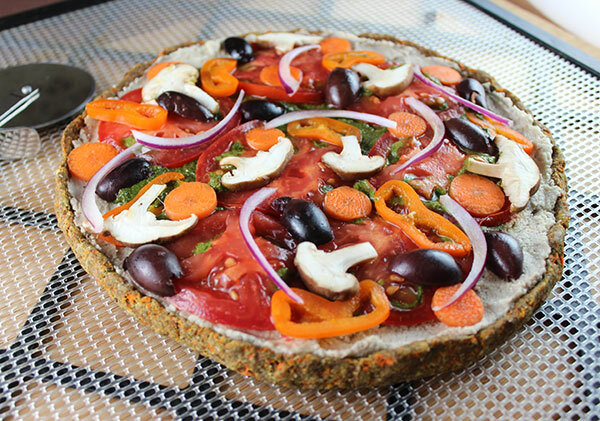 This is our no-bake pizza crust recipe made with essentially three main whole-food ingredients: sprouted buckwheat, chia seeds and carrots. When processed into a dough and dehydrated this combination provides a perfectly firm yet flexible pizza crust texture, similar to New York-style pizza. When making this recipe, we like to divide up the dough portions to create several mini-size pizzas. These are great to have on hand for making instant meals and will keep for several weeks when stored in the fridge. We usually top them with homemade sauce, an assortment of raw veggies, olives and cultured seed cheese, then pop them in the dehydrator for an hour or two to warm and soften the ingredients. 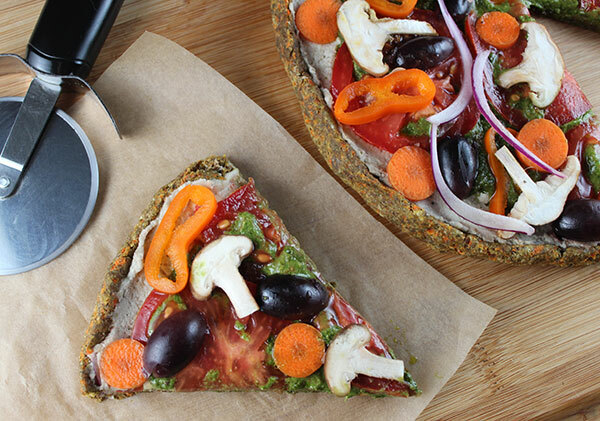 Sprouted buckwheat is a gluten-free alternative we specifically like to incorporate when making flourless pizza crusts to avoid using a concentrated amount of nuts. Sprouted buckwheat is a popular grain for making raw vegan dehydrated cereals as it provides an easy to digest crunchy granola or grapenut-like texture that can be eaten by the bowl with nut milk or sprinkled on various foods, especially fruit salads or desserts, as a topping. 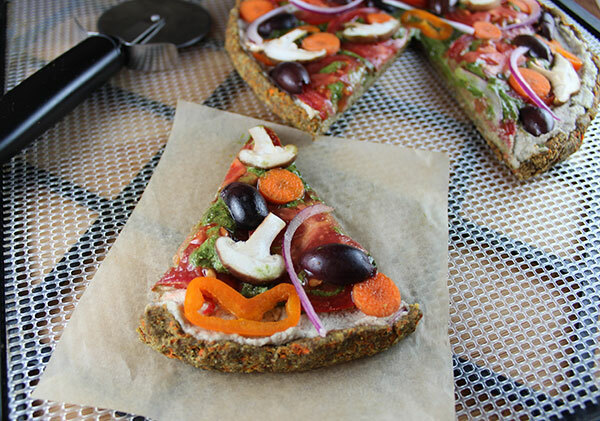 In this pizza crust recipe you will be processing the buckwheat sprouts to form your dough, then dehydrating it. They are one of the few sprouted grains, along with rye and wheat, that we actually use from time to time when making flourless breads, crusts or cracker alternatives. 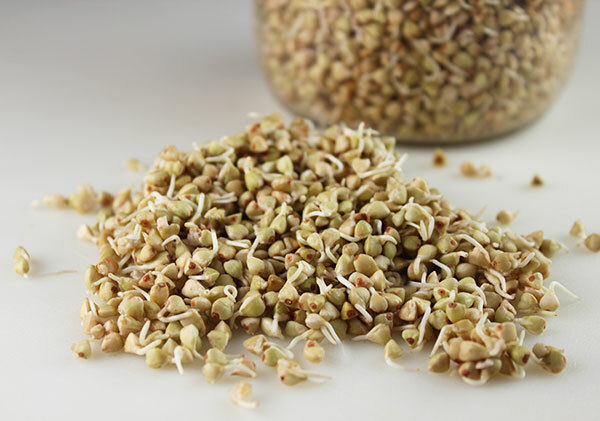 Sprouted buckwheat is created from raw hulled buckwheat groats that have not been toasted. When buying buckwheat in bulk it is important to select the lighter colored seeds rather than toasted brown varieties, also referred to as "kasha." These types are no longer viable for sprouting. 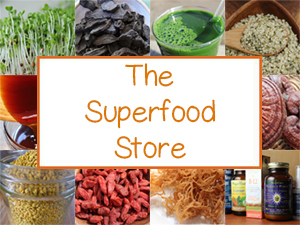 When grains like buckwheat are sprouted they are known to activate enzymes and various nutrients. In one study analysis it was revealed that "in addition to rutin, the buckwheat sprouts contained phenols that were produced in the germination process—isoorientin, orientin, isovitexin, and vitexin." Buckwheat is additionally a gluten-free grain, or technically "seed", that is also less acidic than other types of grains and is a good source of dietary fiber. 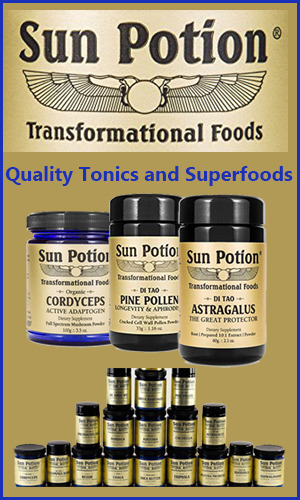 They also contain many important minerals, like magnesium and selenium, as well as higher amounts of niacin, thiamin, riboflavin, pantothenic acid and vitamin B6. 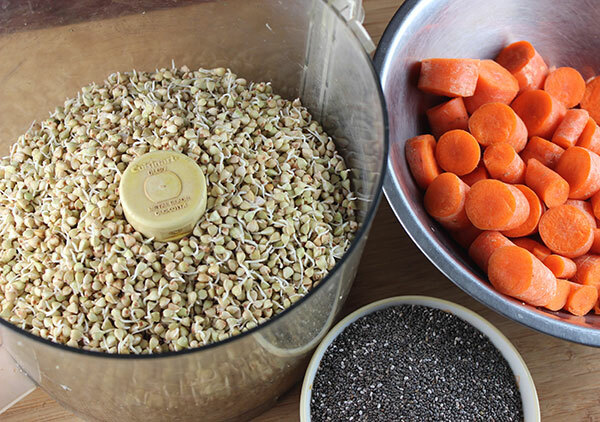 Buckwheat is a fast sprouting grain, but you will need to sprout it a few days in advance. It usually takes between 2-3 days depending on the room temperature. The groats when soaked in water are mucilaginous and will make a thick starchy liquid that should be rinsed several times before the sprouting process. 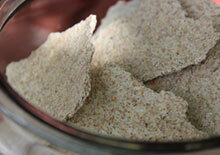 For our pizza crust recipe we use 2C of dry raw buckwheat groats divided between two 1-quart mason jars. Soak the dry buckwheat groats for about 1 hour in pure water. Strain and rinse several times or until a clear, less cloudy, soak water is achieved. Place a mesh sprouting lid on both jars. Rinse and strain once a day leaving the jar tilted upside down on an angle to drain any excess water. Repeat this procedure until tiny white sprouts begin to pop from the buckwheat seeds; these are the buckwheat sprouts you will be using in the pizza crust recipe. If you need more assistance with this process you can follow the instructions on jar sprouting here. Prepare buckwheat sprouts using the instructions above. Grind whole chia seeds to create a fine powder. Using a food processor, grind down the buckwheat sprouts (with salt, and herbs) until it forms a dough ball (this may take a minute or two); set aside in a bowl. Process the chopped carrots into a fine consistency. 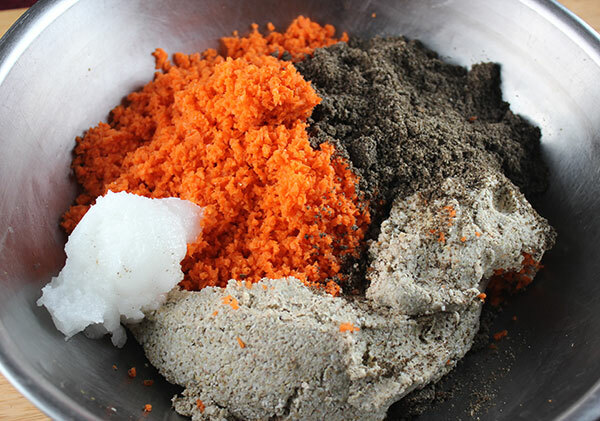 Mix by hand or process all ingredients (dough, carrots, chia and coconut oil) until thoroughly incorporated. Place 1C portions onto a dehydrator non-stick sheet with a screen underneath for support. 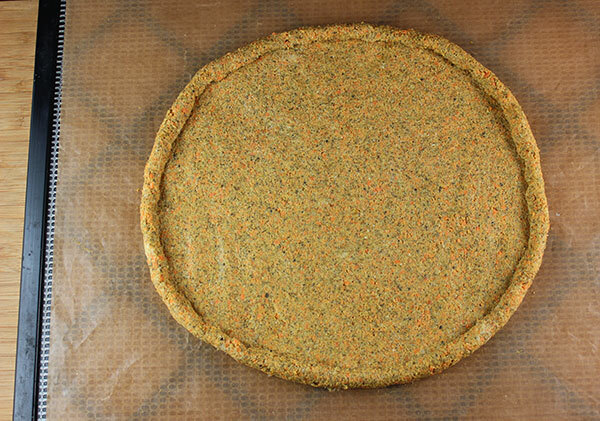 One crust per tray, four trays total, when using an Excalibur dehydrator. Flatten out into a rounded shape (about 1/8-1/4" thick) with a rolling pin or wet hands. 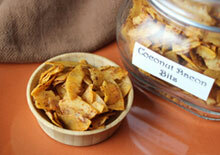 Dehydrate on medium heat setting for approximately 6-8 hours. After 3 hours remove non-stick sheet lining and keep pizza facing upright on the screen only. 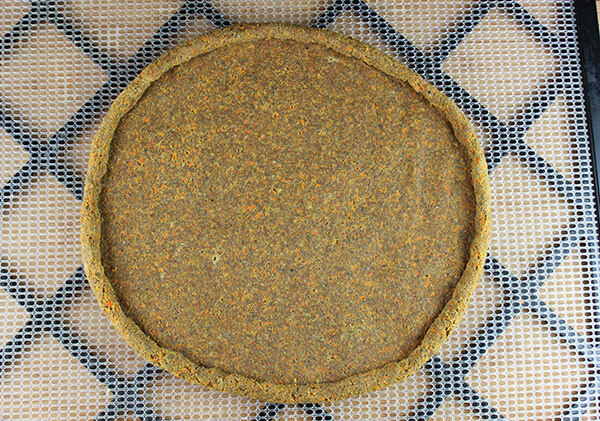 Continue to dehydrate until a dry, yet flexible crust-like texture is attained. This pizza crust recipe makes 4 medium-size mini crusts. You can of course use 1/2C per tray to make smaller meal size portions if desired. 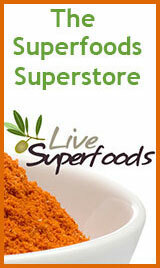 They can be stored in the fridge in a sealed bag or an air tight container and will last for up to 2 weeks or longer. 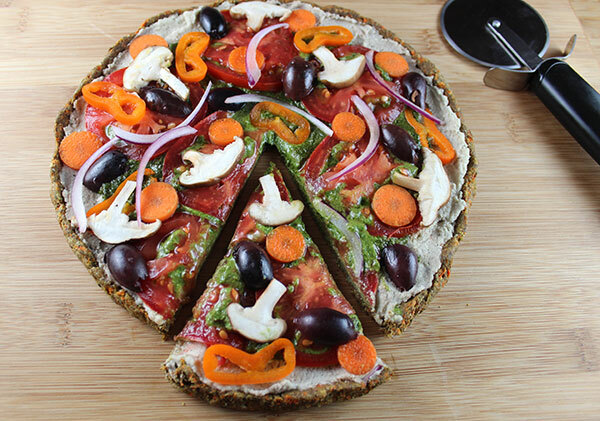 Top your pizza crust with raw marinara sauce, pesto or vegan seed cheese, then add other toppings like raw black olives, onions or onion sprouts, bell pepper and shiitake mushrooms. While buckwheat sprouts are an energizing food to consume on occasion in recipes, buckwheat is also known to contain a natural toxin called fagopyrin. This is compound that can cause a hypersensitivity to light after ingestion for some people, especially when high doses are consumed on a frequent basis. 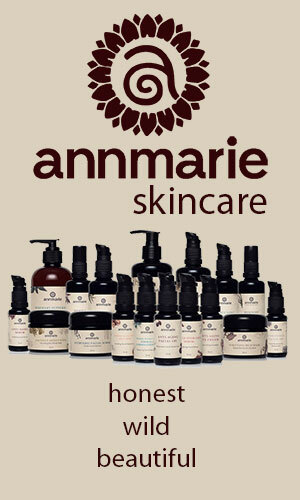 If you are someone allergic to fagopyrin, it will usually produce skin redness and itchiness.